This is my favourite superhero movie of the year. It’s an opinion I’d imagine not many people will not share, which I understand. Wonder Woman was very good, Thor was very entertaining, Logan was really well made, Justice League was… like a small glass of water to a very thirsty fanbase. Spider-Man though, he’s the superhero I grew up on. So I’m predisposed to favour this one. And it doesn’t hurt that Sony did a deal with Marvel so they could finally get the character right after five attempts. When I first saw Tom Holland’s Peter Parker in Civil War, I knew straight away that Marvel had finally gotten the character right. While I like Andrew Garfield’s portrayal of Spider-Man, they still got a lot wrong in those movies. And I hate the Tobey Maguire trilogy, not even nostalgia can make me enjoy those things. Thanks to his appearance in Civil War, there was no need to tell the origin of the character again, thank God, instead we pick up right after with a high school age Peter Parker, bumming about with his friends and trying to juggle his life with being Spider-Man. That’s the thing I appreciate about Spider-Man as a character, he still wants the normal life to be a part of his world. He doesn’t want to just be a superhero. Part of his character has always been the impossible task of being the hero that never lets anyone down, but also being the reliable friend/nephew/boyfriend/student. He wants both aspects of the life but refuses to give up on either when it seems like juggling them is impossible. 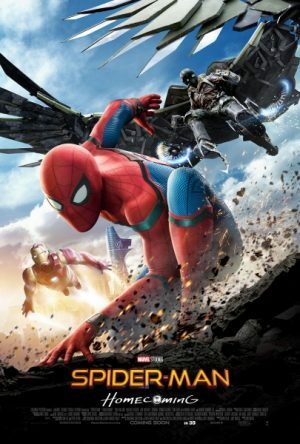 Spider-Man: Homecoming captures that aspect of the character better than any of the other movies have. It captures the character so well, Pete is a doof because he’s a kid, he makes mistakes and his jokes are dumb and Tom Holland pulls off both aspects of the character so well. Not only that, Spider-Man might be the Marvel character with the most heart and Homecoming nails that too. As much as I liked Holland in this movie, Michael Keaton might have been even better as the Vulture. Marvel villains tend to be pretty flimsy, one note characters, Keaton is playing one of the best villains the series has produced. His character is part of an ex cleanup crew that use weapons build from technology left after the attack on New York in the first Avengers. Using these weapons, him and his crew steal more weapons from the Government and Stark to sell on the black market. While that sounds pretty basic, he is a far more complex character than many villains that have come before him. He has a code and rules he works by. He doesn’t want to kill anyone, he just wants to steal from the government that took his livelihood away from him and provide for his family, who he loves. He’s got drive and a human side to him, something a lot of the villains tend to lack as they come across one dimensional. On top of actual drive and complexity behind the character, Keaton brings a real intensity to the role, and that makes him real intimidating. Given, it’s Michael Keaton glowering at baby face Tom Holland, but I really loved him in this movie. I’ve already gone on longer than I should have for this one, but I love Spider-Man. That’s the long and short of it. While technically a 2016 film, it didn’t receive widespread release until early 2017, and I wouldn’t have realistically had a chance to see it earlier than I did, and I don’t want a technicality to stop me from being able to sing this movie’s praises, because this was one hell of a performance. James McAvoy owns this film. 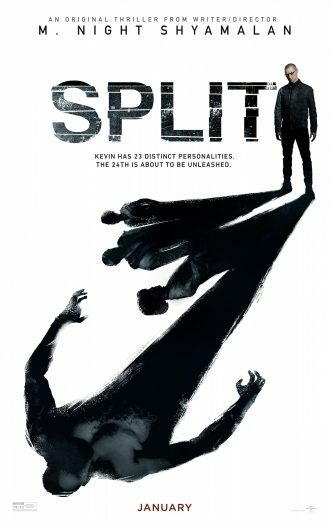 The movie initially seems like a thriller in which someone with split personalities kidnaps a group of teenagers and holds them hostage. Through twists and turns though it becomes something else entirely. The internal war inside McAvoy’s character’s head is a big focus of the movie and the apparent “Beast” that is about to come forth. The shift in McAvoy’s performance as he switches between these characters is a sight to behold and really steals the movie away from the teenagers who are set up to be the protagonists. By the end of the movie, McAvoy’s character becomes the beast and starts rampaging through the city only to end up simply letting the main girl go through his own twisted logic. The movie shifts from being sweet one moment to intense the next and terrifying after that. There were a lot of good performances and moments in the movie, but McAvoy is the reason you come and see this movie, it’s a single actor’s performance spectacle. Shyamalan has become something of a punchline these days, making cheesy movies with ridiculous twists in them. This is, by far, one of the best movies he has made in years. I’d say that most of that comes down to the performance of McAvoy, but this is still a tense and gripping movie that it’s difficult to stop watching. The fact that the twist at the end isn’t one that really effects the movie that comes before it, but instead recontextualises the entire world the movie takes place in was such a cool moment. I really hope this movie gets the sequel that he obviously wants to make next. I really liked this movie. I know this was something of a decisive one amongst critics and the fan base, but after dwelling on it for a while and realising how much I appreciated the choices they made, and the direction they obviously want to go with the series; I am really happy with it. I’m not going to go into too much depth here, because I want to write a more in depth post about the movie after these lists go up. But I’ll give my general thoughts here. While I thought the movie was a touch longer than it needed to be, it broke away from well worn traditions of the genre (pulp action serials) and the expectations people have of what is going to happen in Star Wars movies. While I liked the Force Awakens, I was sad how similar it felt to A New Hope, a sentiment a lot of people shared with me. I was surprised and really happy to find that The Last Jedi bucked all these familiar trends and started to forge the series into something its own. Disney owns Star Wars now, and if they want the series to have legs into the foreseeable future, then they can’t afford to make the safe bets again and have people get bored of their movies three entries into their ∞ year franchise. And I can’t believe I’m saying that about Disney of all companies. But after seeing this movie I’m very excited to see what comes next. 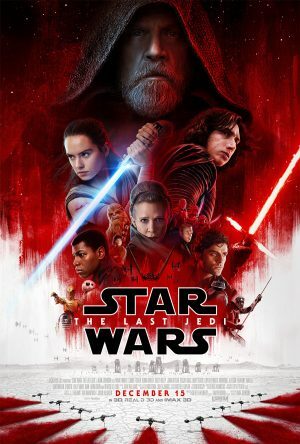 I liked the direction all the characters took, Poe’s journey was great, it was nice to see the character not only having more to do in this entry, but take a leading role. Rey and Kylo Ren’s story was both fascinating and maybe my favourite thing in the movie. I loved seeing Luke doing the Yoda thing, but also having his own story where we learn that he isn’t perfect and needs to make mistakes too, and his final confrontation with The First Order was amazing. The shot of the Rebel ship destroying Snoke’s ship using lightspeed was a very stark and artistic type of shot I’d never expect to see in a Star Wars movie, but this made it all the more effective. And I like Finn, but a lot of his parts of the movie felt a little unnecessary. I rarely get to see great horror anymore. IT is a great horror movie. The problem with modern horror is that the majority of it is really trashy, relegated to January release windows so it won’t have anything to go up against. They are movies that want to get a few cheap screams out of kids. It’s not very often that we see a horror that wants to actually scare you. 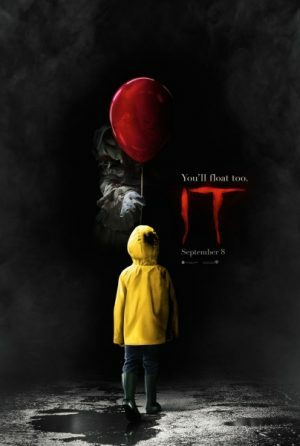 IT is a fantastically made coming of age story about a group of nerdy kids in the 1980s, which also happens to feature a cosmic horror clown which happens to be purely terrifying. It seemed to me that a lot of people had some baggage coming into this movie, having a lot of fond memories of seeing the old mini-series featuring Tim Curry growing up. I have no horse in that particular race, and while I know the story through osmosis, I felt like I was going into this relatively blind. And I loved it. The movie works in so many different styles of horror and while the special effects can come off as somewhat silly looking at times, they feature a clown monster from space, so the silliness kind of makes sense. Even when Pennywise isn’t shifting and transforming there is this horrible sense of dread that follows him around, he can just stand there and creep you out. He works a lot better in his quieter moments when he is just standing there or having a quiet conversation with someone. The moments when he warps and transforms can often come off as pretty funny rather than just scary. But I feel that I ended up laughing to try and break the tension a lot of the time. Plus, as funny as he looks dancing with an angry face, biting people’s arms off or becoming a giant jack in the box, the music and the camera work still make him shocking and scary, despite the absurdity of some of it. The clown isn’t the thing that makes the movie though, all of the kids in the “losers club” are great in this movie. Recent years seem to have given us a lot of very strong child actors, all of them giving very mature performances. I liked all of these characters, they were sympathetic and flawed characters, but they were also funny when they were just being kids. They carry the movie on a lot of heart and by the end you are really cheering them on. IT is a great movie. It’s the best Horror movie I’ve seen in years and I hope so much that studios can come back to making movies like this and really try to scare the crap out of us while also telling a compelling story. I can’t wait for the Fugitive sequel where Richard Kimble Jr. is the the being hunted, the Harrison Ford cameo is going to be dope. That’s the tweet I wanted to make after seeing the new Blade Runner, but I enjoyed this movie so much I didn’t want to spoil it for anyone who might not have seen it already. I feel like enough time has passed though… I loved this movie. I don’t have a huge amount of nostalgia for the original Blade Runner. I saw it, sure, but I was never swooning over it. However, I do recognise how influential that movie was in creating a lot of tropes and aethstic choices when it came to depicting a very specific style of dystopian future. A lot media has a lot to thank Blade runner for in its influence. Blade Runner 2049 takes that on board and makes something special that isn’t beholden to the original movie. Set in the same universe, a number of years later, replicants have integrated into society as low class workers and slaves. Ryan Gosling’s character, K, is a replicant working for the LAPD as a Blade Runner. The movie starts with him decommissioning a rogue replicant on a farm before finding evidence of a dead replicant that somehow seemed to have been pregnant, something that was supposed to be impossible. 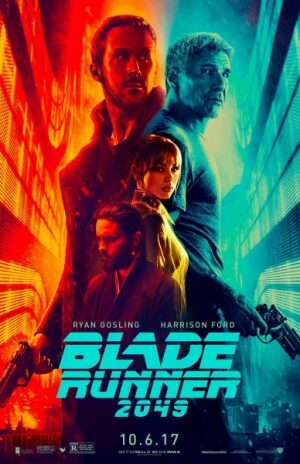 From there the movie becomes a very moody, neo-noir mystery, following K as he tries to get to the root of what happened with his impossible replicant and why his own “false” memories connect him to the whole affair. It’s a slow burn of a movie, not without action, but much of the heavy lifting is done through character dialogue and the quieter, more emotional scenes, mostly by Gosling himself. While Harrison Ford appearance in the movie is memorable, it’s little more than a cameo. Ryan Gosling really owns and carries this movie and his performance in it is outstanding. The plot is great too. The movie is a genuine mystery thriller, which does keep you guessing throughout. There is an amazing bait and switch that really made me love this movie all the more. It played with expectations and consistently surprised me. To top it all off, this is a gorgeous looking film, the visual effects work, while not doing anything too original, is the perfection of the neo-noir future I’ve seen represented in movies so often these past couple years. It’s not necessarily a fast paced, high action thrill ride. But as a piece of very good science fiction, starring some very talented actors, I was blown away by Blade Runner 2049. Posted on January 8, 2018 January 4, 2018 by WooderonPosted in 2017, Best of Year:Tagged 2049, blade runner, disney, harrison ford, it, luke skywalker, michael keaton, pennywise, peter parker, ryan gosling, spiderman homecoming, split, Star Wars, stephen king, the last jedi, tom holland, unbreakable, vulture.